Heading to COP22, Marrakech after featuring prominently at COP21 will be the community of non?state actors, chief among them cities, regions and businesses. A conference on low?carbon technologies will bring together representatives from the top universities. And the “Women Leaders and the Global Transformation” summit planned for November 16, 2016 will host women politicians, NGO chairs and CEOs in Marrakech, Morocco (See Close?Up: “Non-State Actors: Better Organized Every Year“). 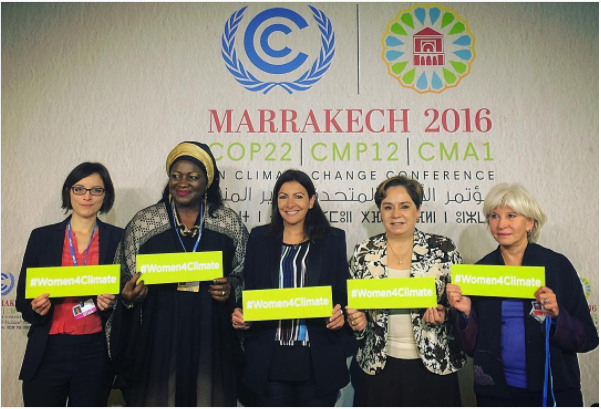 In the Context of the adoption of the United Nations Sustainable Development goals and the historic Paris Climate Agreement at COP21, both followed by the perspective COP22 in Marrakech, the Kingdom of Morocco is convening a worldwide summit on Women Leaders and Global Transformation needed to bring humanity on a low carbon economy trajectory. Through an impressive gathering of active women leaders in different sectors, from all horizons (business CEOs, City Mayors, NGO activists , Politicians, Scientists) this unique Summit was an opportunity to reiterate the new paradigm shift this is happening globally in the area of sustainable development, climate mitigation and adaptation due to solutions provided by women. Strongly mobilized via the call of 08 December 2015 at the COP21, the networks Supplement of Women and Sustainable Development continue to alert by launching a white paper entitled “Women, health, climate, move together towards the COP22 and beyond” Of the conference of 16 November 2016 with the Ministry of Families for Children and Women’s Rights, the Ministry of Environment Morocco at Palmeraie Golf Palace – Marrakech. This publication gathers 22 testimonies of women and men, from the private or public sphere, working in their own way against climate change and its impact on women and health. Yohoo AKON is here at women leaders summit @COP22 and talking about the need of electricity that he was deprived off in his childhood.